I love shrimp, and I love grits. Thankfully, the two go together swimmingly. I've eaten shrimp and grits at just about every place I've ever seen them on the menu, because... well, it's shrimp and grits! I'm sure there are tried and true recipes for this dish out there on the interwebs, but I'm really not interested in them. I like my grits a certain way, and I'm pretty sure this version is much less fussy than all those others. As a matter of fact, if this post makes you crave shrimp and grits, you should make them just the way you like them. Grits are a personal thing, y'all. When I originally made this, I was looking for the quickest way to get from hungry to fed. When left to my own devices (and when on Southern soil) I prefer stone ground grits. They aren't quick, but they are the best of the best as far as I'm concerned. Unfortunately, on this particular day, I was not on Southern soil, nor did I have the patience to cook award winning grits. Besides, even if I had wanted to, I just can't find stone ground grits out here. The best thing I've found is Bob's Red Mill White Corn Grits. They cook up in about 5 minutes. In fact, if you have everything ready to go, this whole shebang can be ready and on the table in under 15 minutes. Fortunately, I've found some cheats that dress them up a bit, and make them almost as good as the real thing! Here's what I did on this particular day. And honestly, I think this will be my go-to method from here on out. It was that good! Get out a medium saucepan and bring the stock and water to a boil. Use a whisk to stir in the grits, then turn the heat down to a pretty good simmer (on my stove, that's medium low). Throw in a pinch of salt and pepper. Stir them every once in a while, and let them cook for about 5 minutes. They will thicken up. Taste a little to make sure the grits are pretty soft. Turn off the heat, then add the cheese to the pot, stirring until it's all melted and creamy. Then put in that splash of heavy cream. I think this is what puts in over the top! Taste and adjust the seasonings. Sometimes I put a few dashes of hot sauce in, just to cut the creaminess and cheesiness. I used my little 8 inch skillet to do this, but you could do it in any smallish pot. Put the pan on the stove and add the oil and garlic. Turn the heat on medium high. Don't heat the pan first, because you want to heat the oil while the garlic is in it so it will be infused with garlic flavor. Let the garlic cook (stirring constantly so it doesn't burn) for about 30 seconds. Throw in the chopped tomatoes and their juices. Picky people might want to tomatoes seeded, but honestly, I didn't have the time or the inclination. Let them cook for a minute or two, just to break them up a bit. Now throw in the shrimp and let them cook until they are just barely pink. Throw in some salt and pepper as well. Please don't overcook them. There are few things sadder in this world than rubbery, overcooked, curled up shrimp. As a matter of fact, after I threw in the shrimp, I turned the heat off and let the residual heat from the pan cook them. Taste and adjust the seasonings. 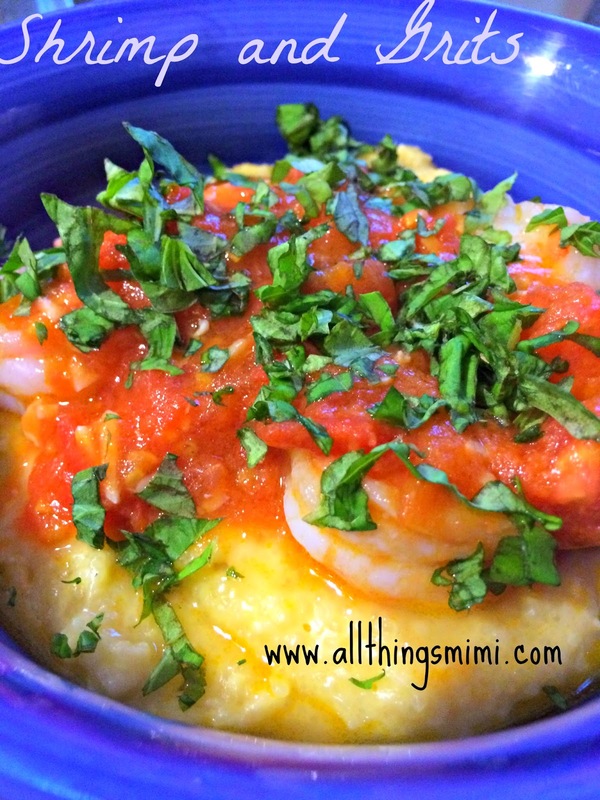 I served the cheesy grits in a big bowl, topped with 6 shrimp (and some of the tomatoey-garlicky goodness) and the torn basil. This is a very satisfying winter meal. It warms you up from the inside! Plus- I had a little bit of cheese grits left over to have for breakfast the next morning- always a good thing!